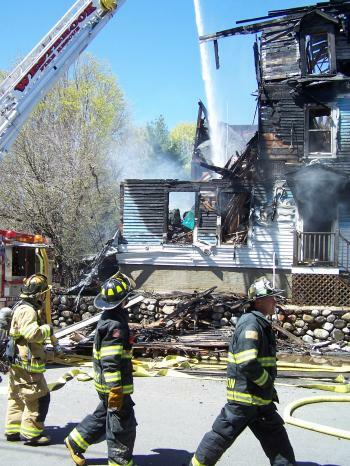 Firefighters are still investigating the cause of a fire that destroyed a Brown Street home on April 26. Westbrook Fire Chief Gary Littlefield said he expected to work into the night and the next morning extinguishing and investigating the cause of a fire that broke out at Wednesday morning at 195 Brown St., engulfing the six-unit apartment building and sending flames and smoke high into the air over Brown Street. Littlefield said he “wouldn’t even attempt to guess” what caused the fire until the investigation is completed. He added that with the amount of damage to the building, finding an answer would be difficult. Littlefield said the building is not structurally sound and will need to be demolished before an investigation begins. All of the tenants escaped the fire, but there were some tense moments for firefighters when they thought one tenant was still trapped in the building. The woman had been visiting a friend and turned up while firefighters were at the scene. Littlefield notified the state fire marshal’s office when they heard someone might still be in the building, which the department is required to do in the event of a potential fatality. The team from the state will also be helping with the investigation. Littlefield said it’s common practice to engage the expertise of the state in extreme fires such as these where extensive damage makes it difficult to divine a cause. According to Littlefield, Westbrook dispatch received numerous calls reporting the blaze at around 11:30 a.m., and he was the first fire department official to arrive. He said when he got there, he could barely see the front of the building because all three levels were in flames and smoke was pouring heavily out of the windows, which had been blown out. “It was roaring when I got here,” he said. Dean Hamlin, who lives in the building, said he was in his first floor apartment when a neighbor came over wanting to use the phone to call 911. Hamlin said smoke was coming out of his neighbor’s apartment in the front of the building. Hamlin said he left the building, and within eight to 10 minutes flames were coming out of the roof and shooting 50 feet into the air. 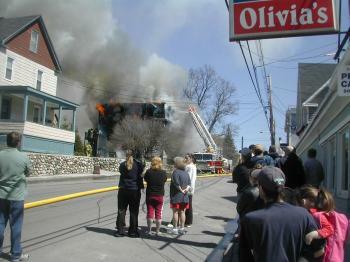 Building owner Larry Sterne said he suspects the fire started in the first-floor front apartment of Hamlin’s neighbor. Sterne said he talked with the tenant, and the tenant told him he’d left his apartment to repair an antenna on the roof for about 10 minutes, and when he returned the curtains in his apartment were on fire. Littlefield said the first attempt by firefighters to enter the building was thwarted by heavy black smoke. The firefighters then changed tactics, fighting the fire from the outside, using automated hoses attached to the ends of ladders. One engine from Westbrook was set to work on the east side of the house and an engine from Portland attacked the fire from the west side. City Councilor Dottie Aube, who lives on the opposite corner of Brown and King streets from the building, said the heat was intense. “We could feel the heat over here,” she said. Aube said the apartment building “burst into flames” three times. “They got it under control, and it started again,” she said. While the two engines reduced the flames coming out of the roof to smoke alone and drenched the inside of the building, friends of Lori Brogan feared she might still be trapped on the second floor. At around 12:45 p.m., as they watched, the left front part of the roof fell in on itself and, within seconds, the upper left portion of the building’s facade crashed down onto the sidewalk below and the left half of the house collapsed. At that point, firefighters from Westbrook, Portland, and Gorham had been working for over an hour when Brogan came running up Brown Street from the direction of St. Hyacinth’s. Until that moment, nobody knew whether she’d gotten out of the building alive. With her arrival, all of the tenants were then accounted for, even the black cat of one resident who was nestling in the arms of a firefighter recovering from smoke inhalation. Brogan was at a friend’s house on North Street. When she saw the ruin of her apartment, she ran under the yellow caution tape and up to within 20 feet of the building, then bent over double, crying. A teenage boy who trailed her up the street hugged her and backed her away from the fire while fire hoses continued to bore into the building. Her landlord was thankful that she’d gotten out as well. A resident of Cape Elizabeth, Sterne said he bought the building in December as an investment to help with his kids’ college educations. He said it’s the first apartment building he’s owned. However, while he’s concerned about the effects of the fire on his own life, he’s more worried about his tenants, who are now homeless. Unfortunately, he doesn’t own any other buildings to transplant them, he said. The Southern Maine Chapter of the American Red Cross released a statement that they will assist “by providing temporary housing, food, and clothing” to the victims of the fire. The Westbrook Fire Department has closed Brown Street to traffic between Walker Street and Myrtle Street until further notice while firefighters continue work, demolish the structurally unsound building, and investigate the fire. Additionally, power on King Street between Brown and Bridge streets will be cut off until further notice. Dean Hamlin holds his cat, fur covered in glass and mouth black from smoke inhalation, after the April 26 fire that destroyed his building at 195 Brown Street. 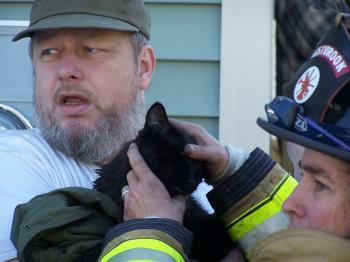 The cat was rescued by Westbrook fire fighters. 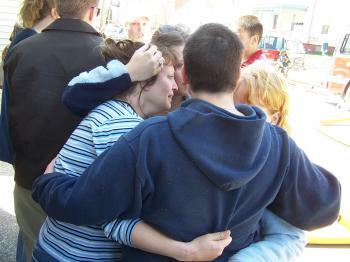 Lori Brogan is held by friends while she watches the remains of her apartment building at 195 Brown Street smolder under the hoses of fire fighters on April 26. Firefighters walk past the collapsed side of a Brown Street apartment building that was destroyed in a fire on April 26. All tenants escaped the fire, and the cause is still under investigation. 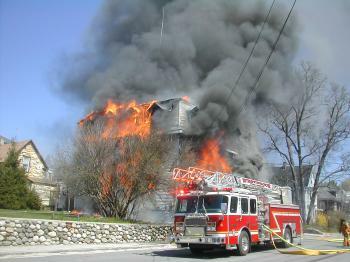 Fire destroyed a Brown Street home during the morning of April 26. Firefighters said the blaze left the building unsound and it would have to be demolished before investigators could determine the cause of the fire. 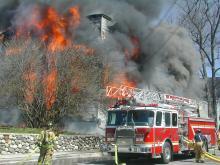 Firefighters battle a blaze that engulfed and destroyed a Brown Street home April 26. The cause of the fire remains under investigation. 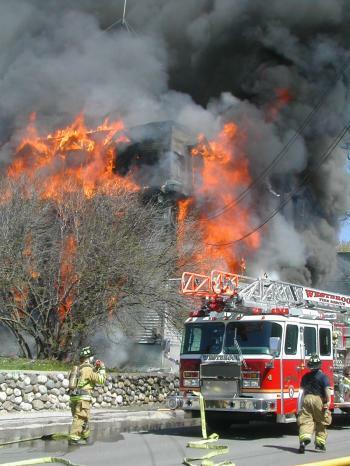 Flames quickly engulfed this Brown Street residence on April 26, making it difficult for firefighters to battle the blaze. Brown Street residents look on as firefighters use ladder trucks to extinguish a fire that destroyed a Brown Street residence April 26.